The Future perfect progressive tense is a verb tense which is used to show that an action will be in progress continuously up to the point of another action in the future. Normally, words like before, when, or for years, etc. are often used with future perfect progressive. The future perfect progressive primarily indicates the duration an action will be continuously in progress before something or another action or a specific time in the future. This means the same as past perfect progressiveOpens in new window; the only difference is that it happens in the future, not the past. The structure, will have + been + present participle of main verb is used to construct this tense. You will have been studying perfect progressive tenses for one hour before Joe comes home. Andy will go to bed at ten P.M. I will get home at midnight. At midnight Andy will be sleeping. Andy will have been sleeping for two hours by the time I get home. By the time I publish my book, I will have been writing it for 14 months. Effiong will have been working at the same mall for six years, come next Monday. When Professor Jones retires next month, he will have taught for 45 years. When Professor Jones retires next month, he will have been teaching for 45 years. These two sentences give exactly the same meaning. 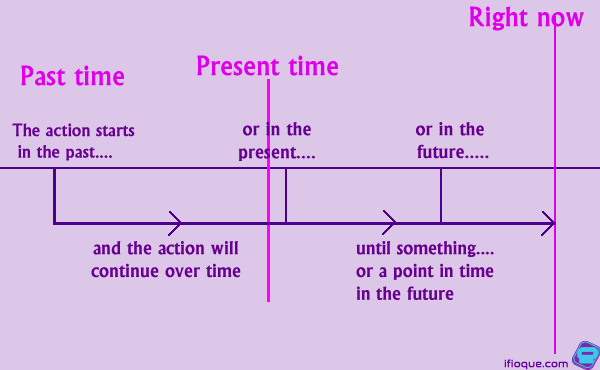 If you have been studying the present perfect progressiveOpens in new window and the past perfect progressiveOpens in new window tenses, you will observe the relatedness of the examples given above to the present perfect progressiveOpens in new window and past perfect progressiveOpens in new window tenses. How to Make Use of The Future Perfect Progressive Tense. 1. Expression of Affirmative Statements with Future Perfect Progressive Tense: To make affirmative statement with future perfect Progressive tense, the structure: (subject) + will have been + ...ing form of verb is used. By the time Geoffrey graduates, he will have been studying for 7 years. When the meat is cooked, it will have been cooking for 12 minutes. Mrs. Juan has been living in Memphis for six years; when she turns 60, she will have been living in Memphis for 12 years. 2. Expression of Negative Statements with Future Perfect Progressive Tense: To make negative statement with future perfect Progressive tense, the structure: (subject) + will not have been + ...ing form of verb is used. The meat should be cooked in ten minutes, if we set the micro-wave’s timer to 9 minutes, it won’t have been burning when the timer stops. John’s place is really far from school, had it been he’s been staying close, he will not have been coming late to class. The man next door is a tenant, if only he has been building his house. He will not have been living in a rented apartment. 3. Expression of Interrogative Statements with Future Perfect Progressive Tense: To make interrogative statement with future perfect Progressive tense, the structure: (interrogative word) + will + subject + have been + ...ing form of verb is used. When daddy gets home, where will he have been coming from? How long will Geoffrey have been studying when he graduates? Mrs. Juan, 54 has been living in Memphis for six years; when she turns 60, how long will she have been living in Memphis? 4. Expression of Negative Interrogative Statements with Future Perfect Progressive Tense: To make negative interrogative statement with future perfect Progressive tense, the structure: (interrogative word) + will not + subject + have been + ...ing form of verb is used. The technique is quite straightforward, why won’t he have been following it? Effiong is usually late, won’t he have been waking up early?